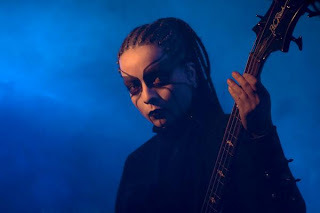 We needed more cornrows in black metal. And it is nice to see a woman donning a little corpse paint for a change. She is a member of a Swiss ambient black metal band whose name and logo makes them look like a Pink Floyd tribute band. Im going to guess "Gallhammer" from Japan?